Ok, I pulled tr7 and tr8, and bingo, perfect sound... no crackling. Resolered all the nearby joints. UHG, crackling when TR7 and 8 are returned in. Should I check the surrounding diodes for failure? First, check the +15V at the plus side of C19, and at the junction of R66 and D8. Then -15V at R68 and R69. Also check the analog ground at the negative side of C18 and the emitters of TR7 and 8, if you didn´t already ofc. Then yes, the diodes are next, specially d7. Followed by the resistors. -15v on the dot at R68 & 69. Analog Ground is good at C18, Tr7 & 8. I tested the surrounding diodes (6,7 & 8) without desoldering, and seem to be ok, break nice at .56v. Surrounding resistors are good as well. Is it the lower voltage on the +15 side? At this point I´ve ran out of ideas. Sorry. Newer chorus boards have an additional ground wire leading to a two or three pins connector in the mainboard. Older mainboards lack this connector. 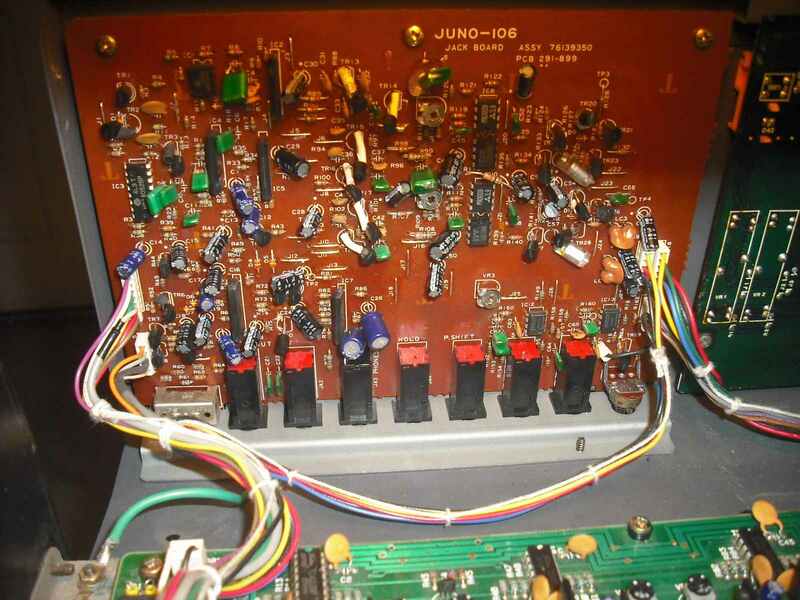 My Juno has a newer chorus and an older mainboard, so I soldered the wire to the nearest analog ground test point. If this wire is left floating, the unit outputs parasitic noises. See the little white rectangular connevtor with a black wire attached, on the bottom right of the chorus? On the top left side of the main board there is a connector with a white wire and a black wire. That´s where the wire goes. Older boards lack that connector but have an AG TP in its place. The white square sits far away from the muting transistors, but maybe it is just what´s needed to lower the ground impedance enough to drain away any residual noise. I simply inspected the board, and decided to resolder all the point, and finish recapping near the output stage. When completed, powered up, and clean as a whistle. Your suggestions were much appreciated! EDIT: Yes, I have the addition black wire soldered to the AG-TP on the module board, I had an alligator lead connecting that the whole time during the service, as I got crazy noises without it as well. BTW where did you get the 3009s? I "borrowed" one from a scrap MKS-30 I have. I want to replace it. I see some in Chile, may take a chance on that. Expensive though... $60 per. And 2-4 weeks for delivery. Do you know of a source? 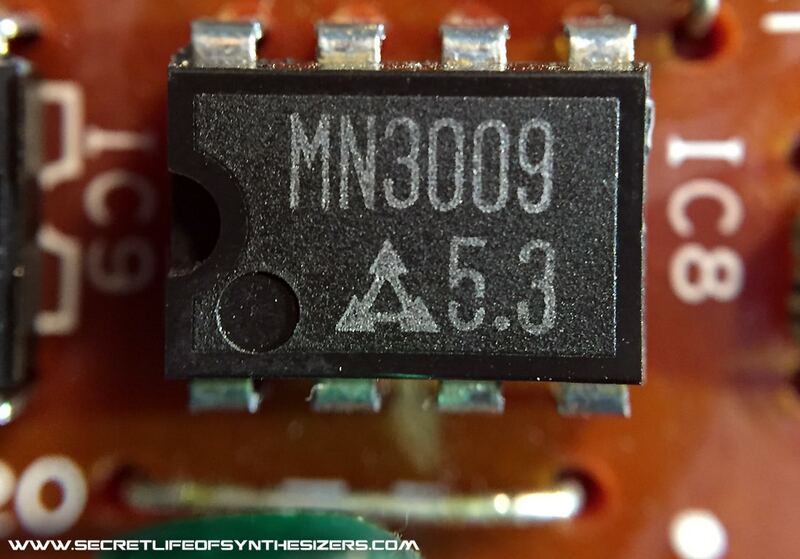 I don´t know of any reliable source of new MN3009s. Beware of fakes. Ask for a picture of the actual item and compare. Listed as NOS. Pic looks spot on.